This bill requires a portion of the annual resource family training to support the case plans, goals, and needs of children in the resource family home, if there are any children in the home, in accordance with applicable written directives or regulations, as specified by the department. The bill also authorizes a county, in its discretion, to require a resource family or applicant to receive one or more hours of relevant specialized training that is in addition to the hours of that training that are required by state law. By imposing a higher level of service on the counties, the bill imposes a state-mandated local program. Assembly Bill (AB) 1067 helps to specify a more comprehensive list of the rights of foster children, and ensure that all foster youth are fully informed of their rights. Specifically, this bill requires the convening of a working group to recommend updates to the Bill of Rights that explicitly includes foster youth and foster parents. The working group is charged with reviewing federal and state law to identify the rights of children in foster care, recommending necessary updates to the Foster Youth Bill of Rights, reviewing the manner in which foster children are apprised of their rights, and recommending changes in the frequency or ways in which foster children are notified of their rights. Maintains sibling relationships through the adoption process by elevating the function of the post- adoption contact agreement between siblings and prospective adoptive children prior to adoption finalization. SB 1060 requires the placing agency, in an adoption proceeding, to order the convening of a meeting, attended by a facilitator, siblings, and the prospective adoptive parents, for the purpose of considering post-adoption sibling contacts. Foster youth with children of their own will now be more likely to stay together due to the passage of AB 260 (Lopez, Chapter 511, Statutes of 2015). This bill protects parenting foster youth from unfair scrutiny by placing restrictions on the types of past information in their case file and how it is used to determine their fitness as a parent. Any party seeking to take away the child of a parenting foster youth must now also demonstrate to the court that efforts have been made to support the success of the parent to keep that family together. SB 342 (Leno, Chapter 492, Statutes of 2013) ensures foster youth receive the mandated periodic visits from their social worker and/or probation officer at the site of their home placement unless otherwise requested by the youth. Although these professionals were already required by law to visit the youth monthly, exceptions were often made resulting in a youth not seeing his/her social worker or probation officer for several months. This bill also prevents social workers from conducting the visits outside of the foster home or group home unless the youth specifically requests it, so as to maintain their privacy. With the signing into law of SB 1099 (Steinberg, Chapter 773, Statutes of 2014), any party can now request a court order for visitation between a youth in foster care and a sibling who is not, as long as that sibling is in the physical custody of a shared biological or legal parent. In addition, the court will now be required to revisit any decision to suspend visitation at each 6-month review hearing. Also, in order to address instances where sibling visitation is technically active but not occurring as desired by the youth, the social worker must now document specific circumstances surrounding visitation in their court report, such as the location, length, frequency, and supervision status. AB 1393 (Skinner, Chapter 391, Statutes of 2009) requires the California Community Colleges and the California State University (CSU), and requests that the University of California (UC), give priority to current and former foster youth for on-campus housing as well as priority for housing that is open the most days in a calendar year to ensure stable housing for foster youth during their college education. More foster youth will be prepared for college, and have increased financial resources to attend. California’s 2006-07 budget partially funded components of AB 2489 (Leno) including $8.2 million for expansion of the Foster Youth Services program, a California Department of Education support program for foster youth and $5.7 million for a state complement to the Chafee Grant (ETV) federal funds so more youth can receive this important financial aid. California acknowledged foster youth’s critical need for permanency and involvement in the development of their permanency plan with the passage of AB 1412 (Leno, Chapter 640, Statutes of 2005). AB 1412 requires social workers to ask all foster youth, not just those in group homes, about who is important to them, and take actions to maintain those relationships. AB 1412 also gives youth the right to be involved in the plans for their life and well-being by allowing them to have input into and participate in the development of their permanency case plan after the age of 12. All foster youth have the chance to finish their high school diploma or equivalency before leaving foster care with the passage of AB 1633 (Evans, Chapter 641, Statutes of 2005). AB 1633 allows foster youth working on a high school equivalency to stay in foster care until the age of 19. AB 1633 also helps more foster youth access social security or SSI/SSP benefits and ensures those benefits are managed appropriately. This new law reinforces the need for everyone working with foster youth to educate youth about their education rights and available resources so that youth receive the help they need to graduate and are able to advocate for themselves. Thousands of foster youth attending non-public schools finally have the opportunity to receive a quality education due to the passage of AB 1858 (Steinberg, Chapter 914, Statutes of 2004). Aiming to improve the quality of education provided at non-public schools, AB 1858 requires them to meet the same standards for appropriate curricula, qualified teachers, and adequate materials and supplies that public schools must meet. Additionally, AB 1858 calls for non-public schools to be monitored similarly to public schools to ensure they are offering appropriate educational services. California affirmed its commitment to foster youths’ education with the passage of AB 490 (Steinberg, Chapter 862, Statutes of 2003). This new law improves public school procedures so that foster youth have a better chance to succeed in school by requiring that youth are not forced to change schools unnecessarily, won’t lose credits, and can immediately enroll and quickly receive records at a new school. The bill also requires designation of a foster youth education liaison in each district. After several attempts to put the rights of foster youth into California law, CYC realized success in 2001 as the foster youth bill of rights became law. AB 899 (Liu, Chapter 683, Statutes of 2001) consolidates all of the rights of foster children into a common location in California law. It also requires social workers to inform youth of their rights at least once every six months. Finally, AB 899 requires the list of rights to be posted in facilities that care for six or more foster children. AB 1979 (Steinberg, Chapter 271, Statutes of 2002) creates statewide regulations for the Independent Living Program. 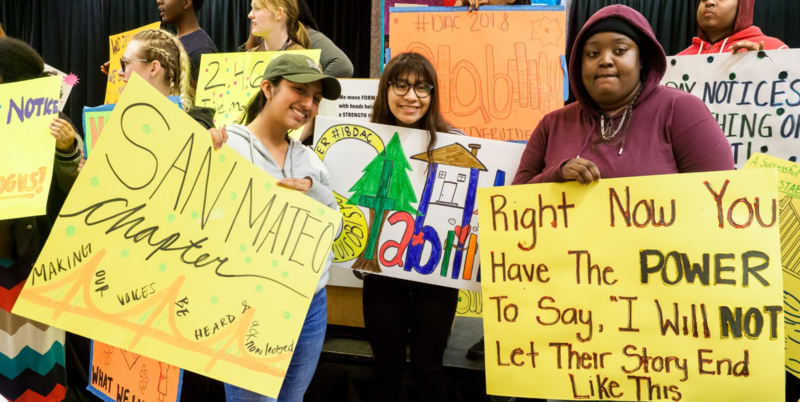 Through these state regulations, AB 1979 aims to ensure every youth in California will have equal, consistent access to this important program regardless of county. Due to the efforts of CYC and other child advocates, foster youth in group homes now have a greater chance to establish a permanent life-long connection with a caring adult. AB 408 (Steinberg, Chapter 813, Statutes of 2003) requires social workers to ask youth over the age of 10 who live in group homes who is important to them and to take actions to support those relationships. AB 408 also strengthens a youth’s right to attend their court hearings, and the right of youth to participate in social and extracurricular activities. The new law also allows funds to be used to convene a team of individuals important to the youth to develop a transition plan. On September 29, 2000, Governor Davis signed AB 1987 (Steinberg, Chapter 909, Statutes of 2000), which requires social workers to include in court reports a section on the child’s sibling relationships and the plans for visitation of siblings. It also requires social workers to notify children on their caseload of significant events in the lives of siblings. This bill aimed to take us one step closer to requiring that siblings be placed together. Thanks to CYC and other child advocates, California was one of the first states in the country to take advantage of a new federal program that allows states to extend Medi-Cal for former foster youth until the age of 21. This law eliminates the re-application process that emancipated youth previously had to go through in order to get health care. This law was enacted through the state budget and AB 2877 (Thompson, Chapter 93, Statutes of 2000). Federal legislation passed in 1999, HR 3443, doubled the amount of money the federal government allocates to states for independent living programs; gives states the option of extending Medi-Cal to age 21; requires states to use some of these funds for former foster youth under age 21; and allows states to use up to 30% of the federal money for housing for emancipating foster youth. In a groundbreaking moment for the state of California, Governor Davis signed AB 427 (Hertzberg, Chapter 125, Statutes of 2001) creating the Supportive Transitional Emancipation Program (STEP), which allows counties to provide monthly financial support to emancipated foster youth as long as they are attending school or working towards the goals outlined in their TILPs. AB 427 also made changes to the state’s Transitional Housing Placement Program (THPP) that encourages providers to create or expand housing programs for current and former foster youth. California gained its first foster care ombudsman because of the efforts of CYC youth on SB 933 (Thompson, Chapter 311, Statutes of 1998). The ombudsman’s office has a statewide toll free number, 1-877-846-1602, where youth can register complaints or concerns regarding the foster care system. AB 2196 (Washington, Chapter 1072, Statutes of 1997) was a CYC sponsored bill to increase contact and visitation when siblings are adopted separately. When a child is going to be adopted, the bill requires the social worker to include a discussion of sibling visitation and contact in the child’s case plan. The bill also authorizes the court to include in an adoption order provisions that will facilitate sibling contact as long as the adoptive parents do not object. AB 1198 (Bates, Chapter 799, Statutes of 1993) created the “in-care” transitional housing option for foster youth 17 years of age or older and in their last year of high school -Transitional Housing Placement Program (THPP). Further modifications were made to THPP in 2001. Youth live in apartments or houses with close monitoring and supervision from the county or from a private agency. AB 2691 (Areias, Chapter 865, Statutes of 1992) allows someone other than a child’s parents or guardians to sign the child’s application for a driver’s license. Probation officers and social workers can sign a driver’s license application without liability for any accidents or tickets the child may incur. Any other person who signs the application will be jointly liable with the child for any damages resulting from the negligent or wrongful act of the child in driving a motor vehicle.